30+ Hilarious Church Signs That Make Religion Fun! With all due respect to people’s beliefs, a lot of the time, any religion couldn’t really be described fun. As much as you enjoyed your faith, ‘hilarious’ wouldn’t really be your first word to describe it, if asked, would it? Let’s be honest. Faith & Religion (whichever you choose) is meant to be about self-sacrifice, thinking of others and generally, just being as good a person that you can be. So, amusement and entertainment wouldn’t really come into that, would it? 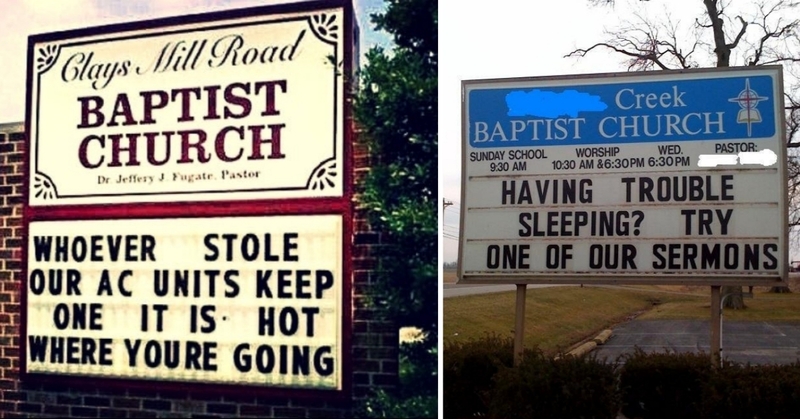 As these next 20 hilarious Church signs prove (& they’re totally genuine!) religion doesn’t have to be all sacrifice and abstinence from fun. Sometimes, it can be about having the best darn sense of humour! & Hey! It works for businesses to have catchy signs outside to entice you in, what should make the Church any exception! ?